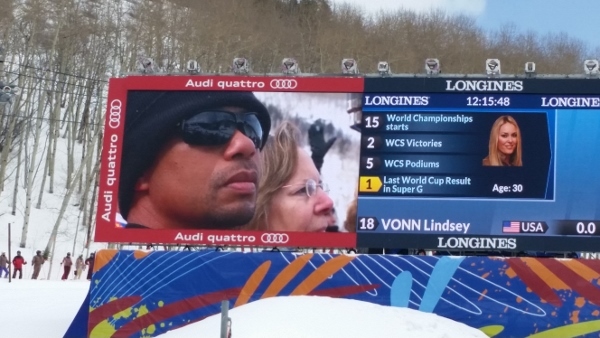 Tiger Woods cheers on Lindsey Vonn on the Jumbotron Tuesday during the women’s super-G at the 2015 Alpine World Ski Championships at Beaver Creek (David O. Williams). Vail’s Lindsey Vonn thrilled her hometown crowd by starting 18th and skiing into first-place position in the women’s super-G at the 2015 Alpine World Ski Championships on Tuesday. Then the very next racer, Slovenia’s Tina Maze, took the air out of the packed finished stadium by bumping Vonn to second. A couple racers after that, Austria’s Anna Fenninger turned in a flawless run to take both Maze and Vonn down a notch. Fenninger won with a time of 1 minute, 10.29 seconds, Maze was three-hundredths of a second back at 1:10.32, and Vonn finished third with a time of 1:10.44 — a little over a 10th of a second out of first. For Vonn, who crashed and blew out her knee last time she raced in a World Championships super-G in 2013, the third-place result will be bittersweet. She’s come all the way back to the top of her sport, but she clearly wanted gold in front of her Vail Valley fans. Vonn was trailing after the second intermediary split on the weather-shortened course, fighting wind and the tough, technical upper section of the course. She made up time and briefly assumed the lead with a powerful attack on the lower section of the course. “I’m really happy with the way I skied today,” Vonn said, according to the FIS. “It was really tough conditions. But to come away with a medal at my hometown World Championships is something really special. “I just wish that the weather was a little bit better,” Vonn added, according to the U.S. Ski Team. “I definitely had a pretty strong headwind right out of the starting gate and for the first couple of gates. I was already three tenths out in the first 20 seconds; it’s a little hard to make up that time. Vonn added that nerves were somewhat of a factor. Fenninger said she had no idea how Vonn and Maze had done when she came down 21st. Maze was happy with her silver in the tough conditions. Vonn’s boyfriend, golfing great Tiger Woods, cheered her off from the finish stadium, but it wasn’t enough to overcome a wind gust that cost her time early in her run. Weather was a factor all day, with new snow and wind forcing a 40-minute race delay. Vonn’s bronze medal, an American record sixth of her career, bodes well for the women’s downhill, which is scheduled for Friday at Beaver Creek. Vonn will clearly be motivated to improve on her result. Vonn won double World Championships gold in downhill and super-G in Val d’Isere, France, in 2009, and two downhill silvers (Are, Sweden, in 2007 and Garmisch, Germany, in 2011). She also won super-G silver in Are. Tuesday’s result was her first bronze at the Worlds. No other American ski racer, male of female, has won six World Championships medals. Bode Miller, Ted Ligety and Julia Mancuso all have five apiece. Ligety and Miller have a shot at matching Vonn’s six-medal mark when the men’s super-G continues the action Wednesday at 11 a.m. The races are free and open to the public. Go to the 2015 Worlds website for more information.